I've done a lot of shows on record labels here on the Legends of the Rocking Dutchman, but few are so odd as the Columbia 30000 "Race" series. Columbia did come from an awful position when it started the series in 1945. It had signed an agreement with the AFM a year later than Decca and the smaller independent record companies, and so they had been affected by the 1942-44 recording strike a whole year longer. In the meanwhile their market share, but also their roster of artists had moved to these labels. But by 1947, the label was for this "Race" series still mainly relying on re-issuing from pre-war masters. 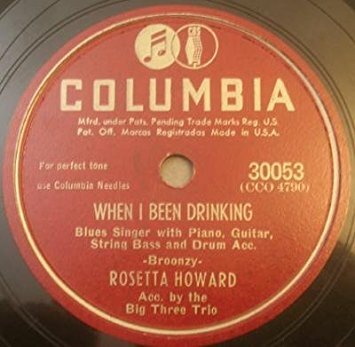 They'd managed to sign only a handful of Rhythm & Blues acts in these two years - the Big Three Trio, Buster Bennett and veterans Memphis Minnie and Big Bill Broonzy. It wasn't until they re-installed the OKeh subsidiary, in 1951, that the company again got some grip on the Rhythm & Blues market.